From Mazar the road climbs over two high passes (Xaidulla 4950 m/16240 ft and Aksai Chin 5190 m/17027 ft) and two dusty forgotten villages onto the Aksai Chin plateau. 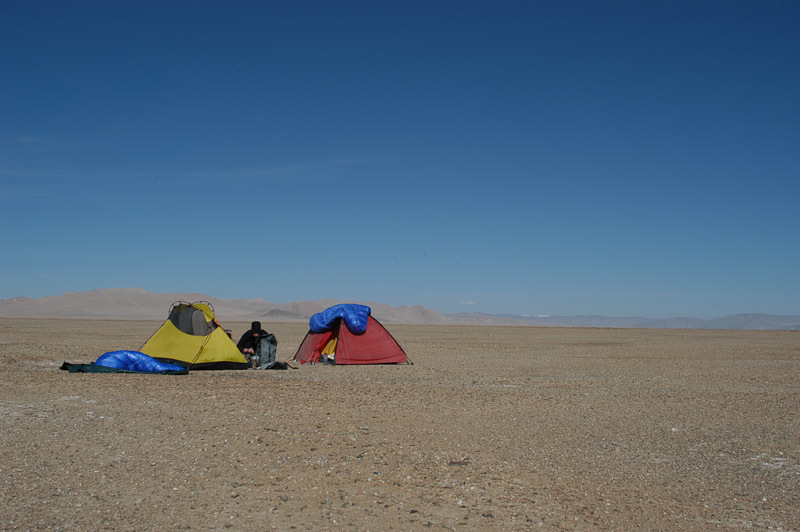 The highest mountain on the plateau is 7013 m (23008 ft) the lowest point is an army camp at 4950 m (16240 ft) where we get water. 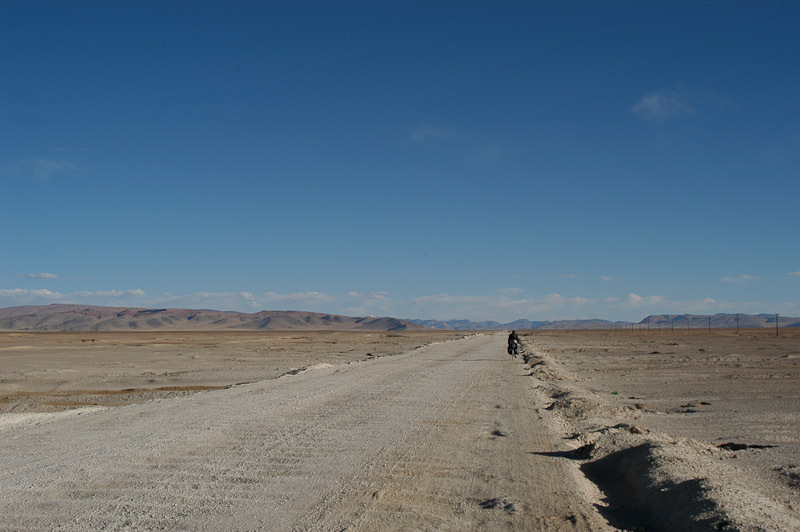 There aren´t any villages for 170 kms (108 mi) until we reach Tielong, with an estimated population of 20. The road is so bad we need four days for these 170 km (108 mi). Until 1962 the plateau was part of India, when the Red Army built Highway 219 across the high desert. It took India two years to become aware of the Chinese occupation. India has claimed the area back since, but so far without success. 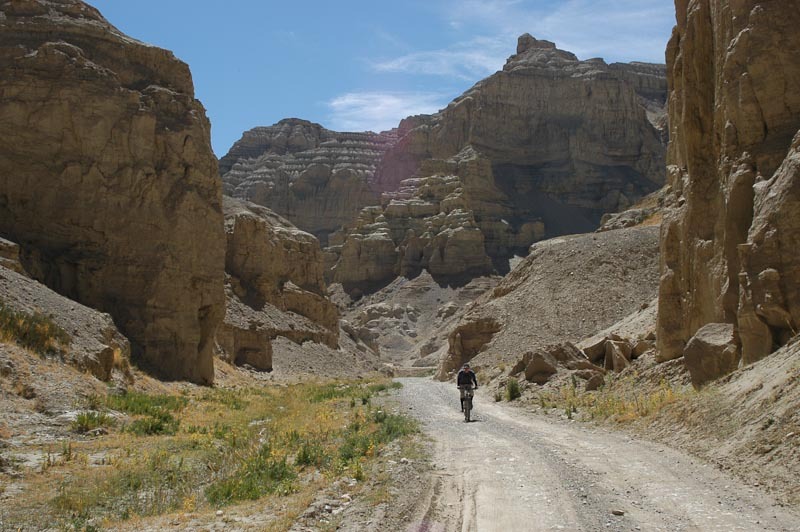 To reach Lhasa before the winter storms we put our bikes onto two blue Dongfeng trucks and drive through the night to Ali. 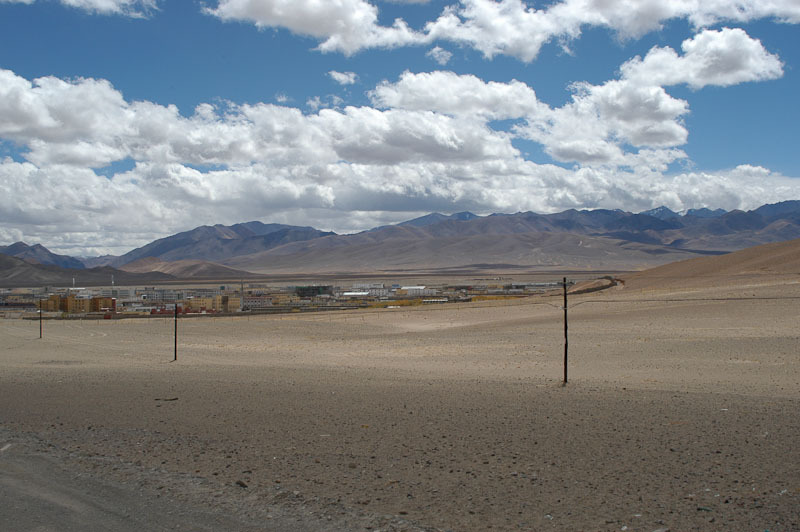 The only town in Tibet´s western province Ngari. Not much in Ali reminds me of Tibet. It is more of a Chinese adminstration and military city. The town is situated at 4300 m (14100 ft) on the banks of the upper Indus river. Everything in the city has to be transported on the back of trucks from Khargilik 1000 km (620 mi) or from Shigatse 1500 km (932 mi) to the east. Both routes aren´t passable for cars. Neither are Landcruisers common private vehicles in China. And there is no airport. With 305.000 km² (120.000 sq mi) Ngari is about the size of Italy, but has an estimated population of only 80.000. Most of the inhabitants live in Ali (about 50.000). The average elevation is above 4500 m (14763 ft). In town we are able to obtain the coveted Alien Travel Permit to legitimise our trip to Lhasa. Without this document no foreigner is allowed to move freely within the TAR (Tibet Autonomous Region). After resting, bathing and relaxing for three days we cycle further east on the freshly paved Highway 219. After 100 km (62 mi) the pavement ends. 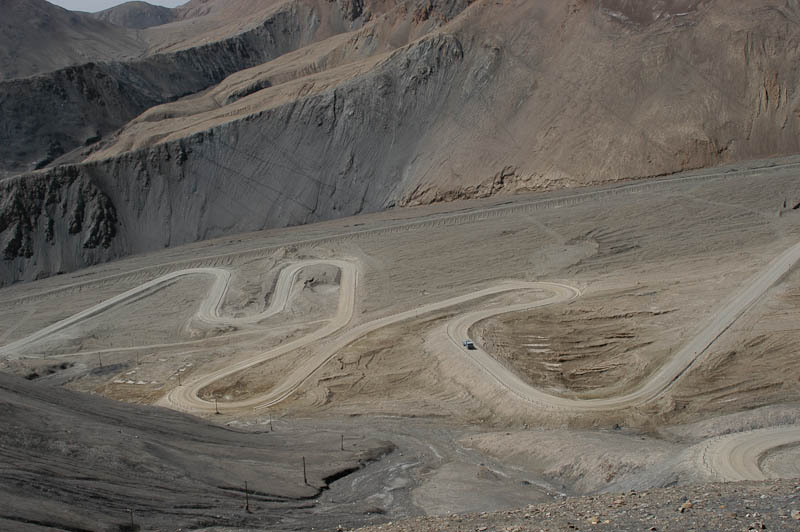 We will see the next paved road 1200 km (745 mi) further east outside of Lhasa. We leave the main road for a short side trip to the kingdom of Guge. The narrow and steep track runs over two snowy passes (5400 m/17716 ft and 5350 m/17552 ft) to Tshada a small town on the bank of the Sutley river. In town we see trees for the first time in three weeks, because Tshada is low in elevation (3800 m/12467 ft). We stay in the only hotel in town and cycle 20 km (12,5 mi) to Guge the following day. From the 10th century on Guge Kingdom was a prosperous trading post between India and Western Tibet situated on the slopes of the Himalaya. 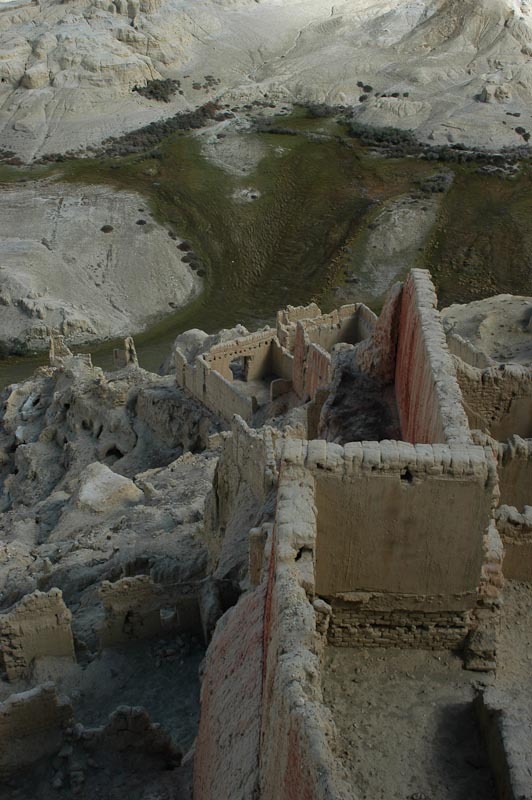 It was destroyed by troops from Ladakh during the 17th century and was never rebuilt. The fortress was dug into the soft sandstone and was fully destroyed in the 1970s during the Chinese Cultural Revolution by Mao´s Red Guards. We have the amzing place almost to ourselves. The scenery with the blue river, the lush green valley and the snow capped mountains of the Himalaya in the distance is fantastic. From here we get another truck ride back to Ali and enjoy two more days at the Yin Hotel. In the lobby we meet a Swiss couple (Markus and Jennifer). They are on their way to Thailand. You can read their story here: bigtrip.milsom.ch. 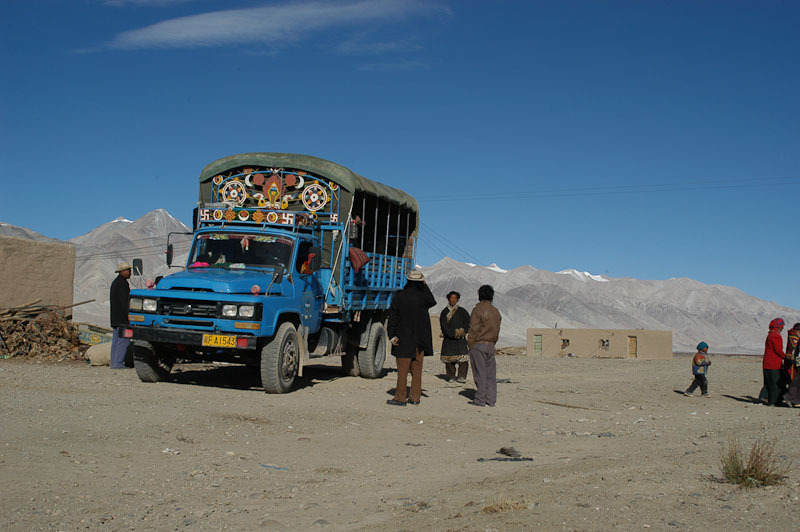 Together we jump onto the back of a pilgrim truck to Darchen at the base of Mt. Kailash, the holy mountain for Buddhists, Hinduists and Bön. The group is very cheerful despite the bumpy ride on bad gravel roads, dust everywhere, cold outside temperatures and the forever vomiting girl. For them we are from a different world. But after a while we are discussing our gear, where we are from and our martial status, without speaking a common language. After one and a half days on the truck we arrive in Darchen. The Tibetans set up their tents below the village and we find basic accommodation. 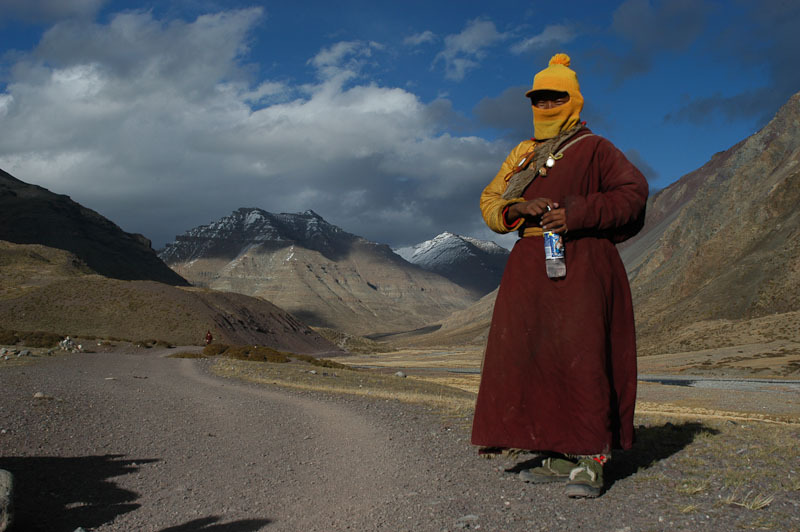 The next day Markus, an Indian swami and I leave two hours before sunrise for the holy kora around Mt. Kailash. Pilgrims are still sleeping next to the trail wrapped in their sheepskin coats at -5°C (22°F). Ahead of us lies a long day with 53 kms (33 mi.) and a 1000 m (3280 ft) climb up to Dölma La Pass. Late riser Wolfram decides to sleep in and do the Kora on his mountain bike. 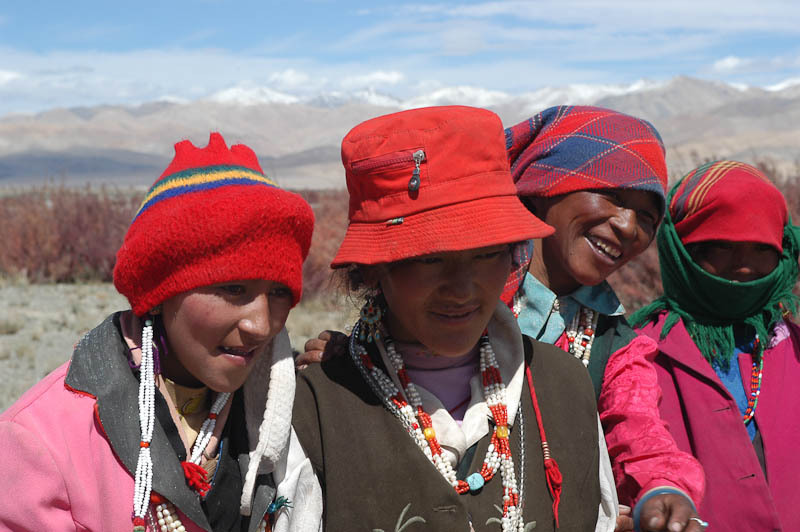 We meet many pilgrims from all over Tibet and tourists that come with guided groups from Western Nepal (Simikot) to visit Mt. Kailash. Prices for these tours start at 1000 Euros per week. Ten times the avarage income of a Tibetan family per year. We meet pilgrims that prostrate around the holy mountain in Asia to reach Nirvana faster. It takes three weeks to do a Kora this way. In the afternoon we are hit by a snowstorm and seek shelter in a tea tent. We meet Wolfram there who started two hours later but had to carry his bike most of the time uphill. Inside we drink butter tea and eat tsampa - the Tibetan national dish. It´s a sticky and fairly flavorless mixture of barley flour and butter tea. But it is warm and very filling. 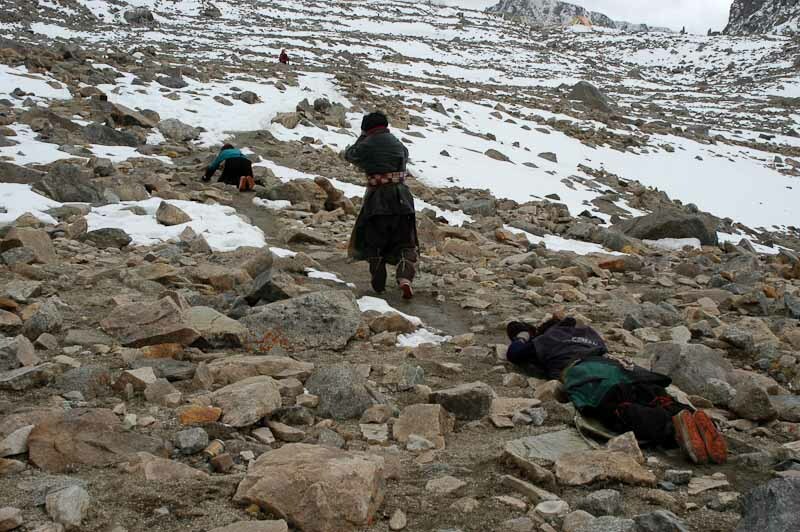 Cyclists can roll down the hill to Darchen within one hour. When we reach the village, the lights are already on.